Celebrities and socialites alike use the hair weave to get the long, luxurious locks that people envy. The hair weave has gone mainstream and is a popular item at hair salons across North America. If you are considering getting a hair weave, you should first weight the pros and cons of getting one done. While it may seem like the ideal solution to boring hair, you may have to deal with pain to get the soft, shiny locks that you crave. A typical, sewn-in weave takes about four hours to complete, depending on the extent of the weave. This is good news for women who are fickle with their hair and love to change it up. A weave can even come in different colors, so you don't have to dye your hair with harsh chemicals to get electric pink streaks throughout. The change is immediate and lasts for about three months. A hair weave can sometimes be painful to have placed in your hair. 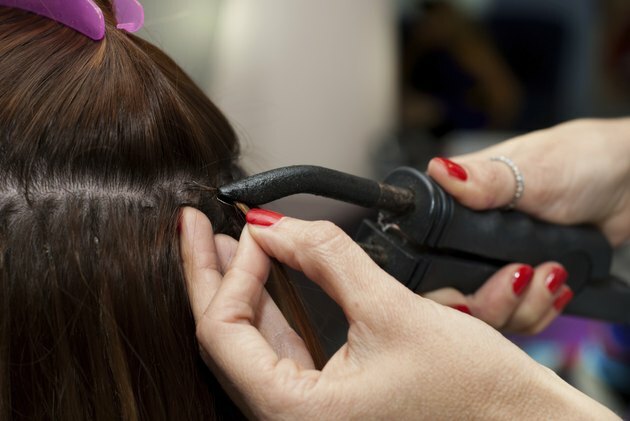 This is because in order to place the weave, the hairstylist must braid the hair tightly along the scalp. After the whole head has been braided, the tracks of hair are then sewn into the braids. This pulling and braiding can be painful, especially if you are sensitive. New bonded hair extensions may be a better choice if you have a low pain tolerance. Women with shorter hair may not want to wait months and years for their hair to grow out. Similarly, some women may have received a haircut that is shorter than they wanted. In these cases, a hair weave is an ideal solution; you'll be able to get the length, without having to wait for your natural hair to grow. A hair weave comes in lengths up to 30 inches, so you can get the length of hair that you want, instantly. A hair weave can be an expensive habit to start. With each weaving session costing around $150, as of time of publication, and weaving needing to be done every three months, hair weaving can be an expensive beauty routine to keep up. If you are looking for a less expensive version, clip-in extensions may be a more economical choice. After years of coloring, perming and styling, hair can become weak and damaged. A hair weave can help protect your natural hair. Binding it into the braids means that the hair weave takes all the abuse of styling tools and products -- and they'll be removed in three months. Your natural hair can take time to be protected while bound. Some women even find that when their hair is damaged to the point of breaking, a weave can help them gain some of their hair strength back. Unfortunately, not all hair weaves are created equally. With the case of the weave, what you pay for is what you get. That means that a less expensive weave may be obvious and fake-looking. The best weaves, as noted by Vita's Hair Salon in Maryland, are made out of natural human hair. These are the ones that can match the color and texture of real hair, blending in with yours. A weave made of synthetic hair is less expensive but may also look fake, as it does not mimic the real texture of hair. Be wary of a cheap weave that does not look real.